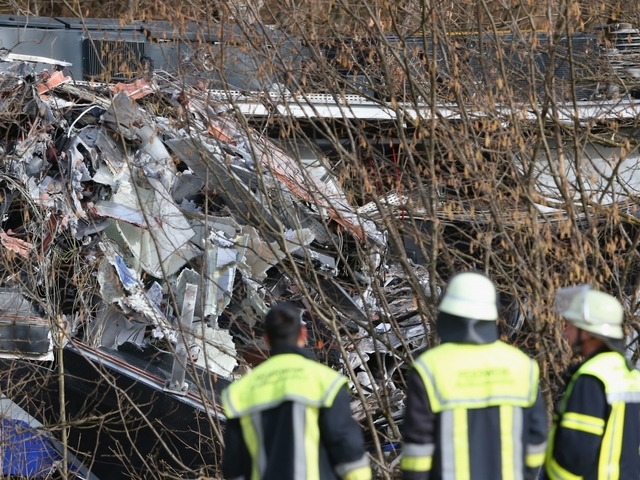 BAD AIBLING, Germany (AP) — Two commuter trains crashed head-on Tuesday in southern Germany, killing 10 people and injuring 80 as they slammed into each other on a curve after an automatic safety braking system apparently failed, the transport minister said. The regional trains collided before 7 a.m. on the single line that runs near Bad Aibling in the German state of Bavaria. Aerial footage shot by APTN showed that the impact tore the two engines apart, shredded metal train cars and flipped several of them on their sides off the rails. The first emergency units were on the scene within three minutes of receiving the call, but with a river on one side and a forest on the other, it took hours to reach some of the injured in the wreckage. Hundreds of rescue crews using helicopters and small boats shuttled injured passengers to the other side of the Mangfall River to waiting ambulances, which took them to hospitals across southern Bavaria. Nine people were reported dead immediately while a tenth died later in a hospital, police spokesman Stefan Sonntag said, adding that the two train drivers were thought to be among the dead and one person was still missing in the wreckage. "We have little more than hope of finding them still alive," he said. "This is the biggest accident we have had in years in this region." German rail operator Deutsche Bahn said safety systems on the stretch had been checked as recently as last week, but Transport Minister Alexander Dobrindt suggested that a system designed to automatically brake trains if they accidentally end up on the same track didn't seem to have functioned properly. Dobrindt, however, said it was too early to draw a definitive conclusion. "The site is on a curve. We have to assume that the train drivers had no visual contact and hit each other without braking," Dobrindt told reporters in Bad Aibling, adding that speeds of up to 100 kph (60 mph) were possible on the stretch. Black boxes from both trains had been recovered and are now being analyzed, which should show what went wrong, Dobrindt said. "We need to determine immediately whether it was a technical problem or a human mistake," he said. Authorities had initially reported 150 injured but Sonntag later lowered that figure to 80. Seventeen had injuries considered serious, he said. Each train can hold up to 1,000 passengers and they are commonly used by children traveling to school. Fewer than 200 people in all were on board Tuesday, however, because of regional holidays to celebrate Carnival. "We're lucky that we're on the Carnival holidays, because usually many more people are on these trains," regional police chief Robert Kopp said. About 700 emergency personnel from Germany and neighboring Austria were involved in the rescue effort, using about a dozen helicopters. Train operator Bayerische Oberlandbahn started a hotline for family and friends desperate to check on passengers. "This is a huge shock. We are doing everything to help the passengers, relatives and employees," said Bernd Rosenbusch, the head of the Bayerische Oberlandbahn. In Munich, 60 kilometers (40 miles) away, the city blood center put out an urgent call for immediate donations in the wake of the crash. Germany is known for the quality of its train service, but the country has seen several other accidents, typically at road crossings. Most recently, a train driver and a passenger were killed in May when a train hit the trailer of a tractor in western Germany, and another 20 people were injured. In 2011, 10 people were killed and 23 injured in a head-on collision of a passenger train and a cargo train on a single-line track close to Saxony-Anhalt's state capital of Magdeburg in eastern Germany. Germany's worst train accident took place in 1998, when a high-speed ICE train crashed in the northern German town of Eschede, killing 101 people and injuring more than 80.